Exciting things are happening at Abiding Presence! Earlier this fall we shared with you the news that Abiding Presence was chosen as one of twelve congregations across the country (and the only Lutheran congregation) to participate in a "Community of Practice" with the Log College Project through Princeton Seminary. We're now getting to work discerning, learning, praying and listening to how God is calling us to innovate our ministry with and to the senior high youth. We're thinking about both the youth who are already at Abiding Presence and the youth in our area who might be searching or longing for a faith community. Each quarter during the 2018-2019 school year we will be given an activity to help us reimagine our youth ministry. Our first activity has been to research the history of Abiding Presence and to share it with the whole congregation so we can discern, learn, pray and listen to God together. Specifically, we have been looking at the footprint of our church's innovation. The more we have researched, the more we have discovered just how much innovation we have in our history! Whether it was transforming a movie theater into a worship space when we first began, changing the seating direction in the sanctuary, launching three distinct worship experiences, dreaming of playground or launching weekday ministries to children and families such as MOPS and Mainly Music - Abiding Presence has been a church listening to God's bold vision and reimagining what the church might look like. 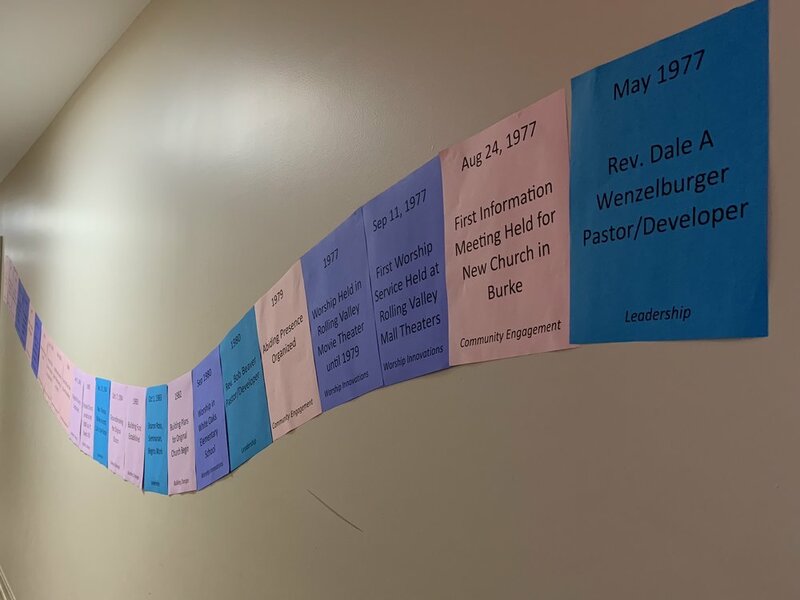 As you come to church over the course of the next few weeks, please take a look at the timeline running on the walls that tells some of our story. It's not inclusive of every single thing we've done in the past 40 years as it would take a renovation project to give us enough wall space for that! It does, however, offer some highlights of where we've been and how we've responded to God's call. We need you to please do more than just look at the papers on the wall, though. Please take a moment to prayerfully walk the timeline with one of the "Guide through History” papers. Jot down what surprises you, excites you or where you experience God nudging us into the future. When you're done, place your "Guide through History" in the box in the church office. We'll have a drawing for a special prize "historical prize" from the guides collected. More than anything else, please join us in praying for our hearts and minds to be open to how God is calling us to be church in the future.